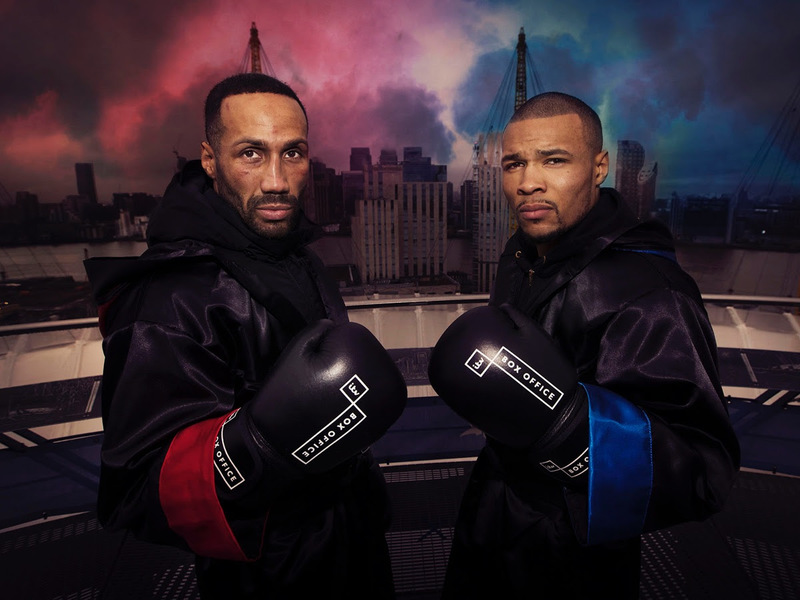 James DeGale and Chris Eubank Jr. squared up on top of the world-famous O2 today ahead of their much-anticipated fight inside the arena on February 23. Going toe-to-toe with the stunning London skyline as the backdrop, the pair faced off 52 metres above ground level on the Up At The O2 walkway – with the city’s brooding clouds a perfect match for the fight’s title – A Storm Is Coming. The boxers set foot on the landmark’s famous canvas roof as they count down the weeks before they enter the ring staged beneath it on 23 February where they will each aim to send the other tumbling to the canvas in defeat. Donning ITV Box Office-branded robes and gloves for the event, the fighters continued the build-up to their electrifying Super Middleweight clash with a few words to each other as they were filmed by a drone as part of the channel’s fight promotion ahead of its exclusive live coverage. The fight will be shown exclusively live on ITV Box Office and features a full undercard including Lee Selby’s big ring return against Omar Douglas, a heavyweight collision between Commonwealth Champion Joe Joyce and challenger and Former World Champion Bermane Stiverne and the British Light-Heavyweight Title Eliminator between Andre Sterling and Ricky Summers. As a bonus for fight fans, later in the evening ITV Box Office will feature live coverage of the WBC Super Middleweight title fight between Anthony Dirrell and Avni Yildirim. All the action from this clash will come live from Minneapolis, Minnesota following the conclusion of DeGale v Eubank Jr. Meanwhile, legendary boxing International Hall of Fame ring announcer Jimmy Lennon Jr has been confirmed as the master of ceremonies for the evening. For ITV Box Office, Mark Pougatch hosts live from ringside, with commentary from Ronald McIntosh and Duke McKenzie, and reporting from Gabriel Clarke. Brought to you by ITV Box Office, Premier Boxing Champions and promoted by Poxon Sports, access to the event is priced at £19.95 and is now available to buy for Sky customers. Full details on how to access the event are found in Notes To Editors at the end of this release. Late last year, ITV announced a ground-breaking new deal with Haymon Sports and Premier Boxing Champions (PBC) to bring exclusive coverage of exciting PBC world-class boxing events to ITV viewers and fight fans in the UK. The unique collaboration is the first time that Haymon Sports and PBC has partnered with a UK broadcaster to stage boxing events regularly in the UK. The exclusive three-year deal will guarantee a minimum of 15 televised events each year, drawing from PBC’s unrivalled group of over 160 of the best boxers in the world, which includes more than 60 current and former world champions in matches staged both in the UK and the US. PBC, the sports’ pre-eminent boxing brand, is broadcast over cable and network television in the United States. The world-class action from events for the next three years will include free-to-air broadcasts on ITV’s channels, including ITV main channel and ITV4 and ITV Hub, and will also include pay per views on ITV’s PPV channel, ITV Box Office. This new deal for boxing adds to ITV Sport’s portfolio of first class events, which includes exclusive free to air coverage of the England football team’s qualifiers for both the European Championship and World Cup, the 6 Nations and exclusive coverage of the Rugby World Cup, UK horse racing, the Tour de France and the French Open.